Just an FYI: Not everyone, including those close to the deceased in Sutherland Springs, sees what happened as simply the act of a lone gunmen. There are many strange factors in the case (not unlike in the case of the Vegas massacre) that the media simply isn't discussing. -W.E. A disturbing scene in the 2014 movie Kingsman: The Secret Service features the hero killing an entire congregation inside a Baptist-style church in the Southern U.S. similar to the one in Texas. 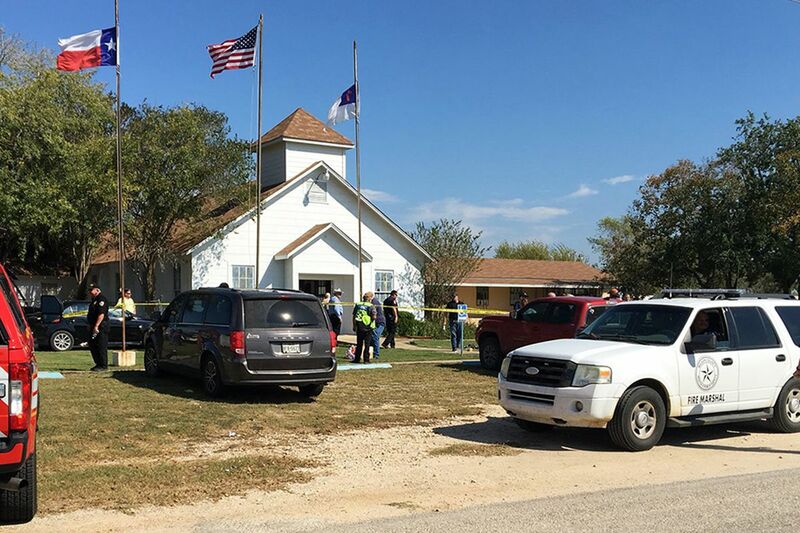 On November 5th, Devin Kelley entered the First Baptist Church of a small town in Texas during the Sunday service, while wearing a skull mask and a ballistic vest. Armed with a Ruger AR-556 rifle and two handguns, Kelley fired into the crowd, killing 26 people, including several children. Not unlike several mass shooters in the past, Devin Kelley had served in the military for some time, including a 12-month stint in confinement. Kelley was once a member of the US Air Force, spokeswoman Ann Stefanek said. He served in logistics readiness at Holloman Air Force Base in New Mexico, starting in 2010. Kelley was court-martialed in 2012 for two counts of Article 128 of the Uniform Code of Military Justice, assault on his spouse and assault on their child, Stefanek said. Kelley received a bad conduct discharge, confinement for 12 months and a reduction in rank, she said. The Air Force did not provide a date of the discharge. Various accounts about Kelley are surfacing in mass media. Some news reports state that he was an “aggressive atheist” who often took to social media. His Linkedin profile states that he was an ex–Bible studies teacher, which is somewhat contradictory with shooting up a church. Both his family and his wife had strong ties to the church. According to a profile on Indeed.com, Kelley’s wife was a “teacher for toddlers” at First Baptist of Sutherland Springs from June of 2009 to March of 2013. Her responsibilities included teaching the children about God, helping with “their life stones that are needed,” and being a “positive influence in their life,” the page stated. New police reports state that Kelley had “issues” with his mother-in-law who usually attends the church, but she was not present that day. So what truly motivated the shooter to kill? Could he have been programmed in the military to carry out this horrific mission? The public was certainly programmed to witness it. The First Baptist Church in Texas. “I’m a Catholic w**Re who’s currently enjoying congress out of wedlock with my black Jewish boyfriend who works in a military abortion clinic. So, hail Satan and have a lovely afternoon madam”. Galahad then proceeds to kill every single person in the church, in a long, dragged-out, extremely gory scene with rock music playing in the background. Galahad shoots a woman in the head. In the end, he kills every single person in the church. Oh and he is the good guy. As Galahad leaves South Glade Mission Church, we see a gloomy message: America is doomed. In my article “Kingsman: The Secret Service” or How to Sell the Occult Elite to the Youth, I explained how this entire movie discloses the elite’s agenda. It even ends with the world’s elite hiding in a remote location as the masses get slaughtered. In the movie, Galahad’s murderous spree is explained by him being “mind-controlled” by a chip on his phone. Was Kelley mind-controlled as well? One thing is for sure, the killing of people while they are actively worshipping God is, on a spiritual level, extremely powerful. People of Christian faith call their church the “house of God”. Inside the house of God, they pray and commune with God. For many, it is a sacred and solemn moment of intense spirituality. To enter the house of God and turn it into a bloodbath while the congregation is in active worship is effectively, on a spiritual level, a satanic ritual. As seen above, in Kingsman, right before killing everyone worshipping in a church, Galahad actually says “Hail Satan”. The mass media synchronicities do not stop there. The “revoltingly violent” series Preacher takes place in Texas. 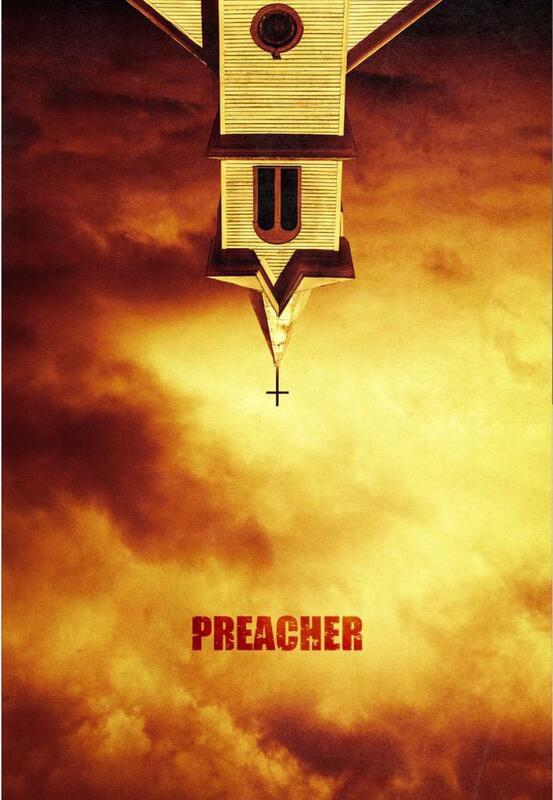 The official poster features an upside-down church which forces us to see an inverted cross: A symbol of satanism. Only hours after the church shooting, Marilyn Manson (a stated member of the Church of Satan) appeared on stage pointing a fake rifle at his audience. The rifle has an inverted Cross of Lorraine on it. The concert took place in San Bernardino, a city that experienced a mass shooting in December 2015. Two of the deadliest mass shootings in American history have happened in the last 35 days. In the wake of these tragedies, as if it has become a new custom, many immediately took to social media to instrumentalize the tragedy, using it to justify their political agenda, while bypassing any kind of human consideration in the process. Indeed, in these dark times punctuated with senseless mass shootings, the human cost of the tragedies is almost completely overlooked. Many now eagerly await the identity of the shooters to be revealed so they can start finger-pointing and launch into agenda-pushing. It seems that the never-ending string of mass killings happening across the world has effectively made people indifferent to human suffering. Mass shootings are now “political checkpoints”, convenient arguments to bring up during political debates. Even worse, the saying “thoughts and prayers” has become an ironic meme, a comment on how blasé and powerless society has become faced in the face of intolerable horror. However, one cannot really blame regular people for not caring enough. If we were to become depressed for days everytime a shooting happens, we could not even function. The fact is, when a source of pain is reoccurring, the human body naturally responds by numbing the source of pain in order to be able to preserve its health. The same way bare feet exposed to rugged terrain all day become thick and hardened over time, our ability to feel grief and sadness inevitably becomes more calloused with every recurring tragedy. This is where we are heading. More accurately: This is where we are being taken. We are being made numb to the killing of innocent people, numb to the pain and suffering of other humans. People are debating endlessly amongst each other about evil Muslims, evil rednecks, evil liberals, and evil conservatives, while not realizing that we’re all in the same boat. These source of these killings is the same source as the movies and music we’re paying to see and hear. We are all the enemy they are trying to vanquish: our minds, our souls, even our ability to feel compassion. Through their terror, they are numbing us, dividing us, and demoralizing us. And through their media, they are preparing us.